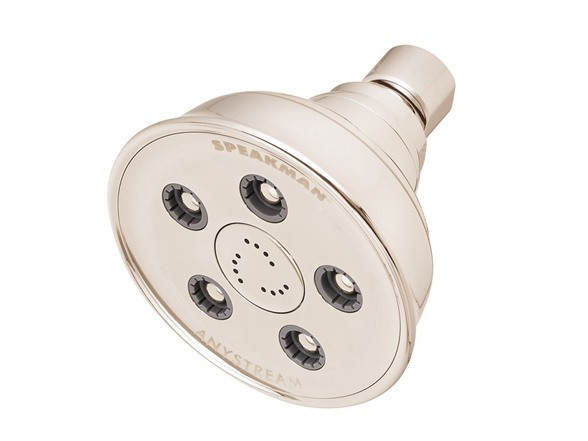 A massage showerhead with a classical look and powered by patented Speakman technology, the Anystream® Caspian Showerhead provides luxurious, full-body sprays from an ergonomically classically styled fixture that attaches to any standard shower arm. 5 adjustable Speakman stream nozzles and 12 center pulsating massage jets combine to produce 50 invigorating full-body sprays under any water pressure. By simply rotating the faceplate the showerhead transitions effortlessly through 360° of gentle rain, full-flood and therapeutic, pulsating massage spray settings. Precision-engineered Speakman components and materials resist sediment buildup.